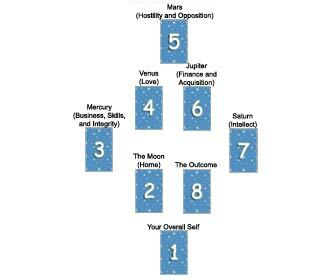 Like tarot cards, playing cards can be used to perform readings using the very same spreads. 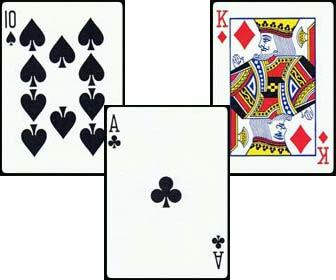 In fact, historical evidence says that playing cards were probably being used to perform fortune telling even before the tarot cards, dating back to the 1400's. In the late 1700's, a cartomancer named Etteilla began using reversed cards in his spreads, for which he used a section of a deck of modified playing cards that had notes containing the card meanings printed on them. Madam Lenormand was the most famous cartomancer of the era, who was said to have read the fortune of Napoleon. If you are not yet familiar with the spreads on this site, it is recommended that you should read through the list in order to find one that is best suited to answer your question. Our playing card spreads are identical to our tarot spreads, along with the rune casts and other online oracles which require certain patterns to be laid out in groups in order to be read in a story-like fashion. We have 20 great spreads on the site for you to select from, which have been designed to answer any types of questions that may arise.